2008’s surprise hit Taken was an uber-violent action flick starring ‘serious actor’ Liam Neeson (who let’s not forget was also in Krull…) as a steely eyed remorseless killing machine willing to do anything to retrieve his young daughter from the clutches of an evil forced prostitution ring. Taken was fresh, cool and frankly awesome, and completely unexpected. Taken 2 on the other hand is so very ‘expected’, both in terms of actually existing (you can’t not follow up a film that returns over 200M on a 25M budget), and in terms of what appears onscreen, which is essentially a blend of the illogical and the clichéd in equal – and equally frustrating – proportions. Regardless of logic, the Albanians bury the dead. They are a hairy bunch too, apparently razors are a no-no in Albania, and the hairiest and therefore most influential of them all swears vengeance upon Mr Mills. Lenore on the other hand has seen her second marriage hit a wall, which means she is a little less frosty to Brian, who himself is far more relaxed and content with life. Well it’s about to get busier for the Mills (and whatever hyphenated name Lenore went with). Brian is still performing bodyguard and security services for those wanting gents with ‘special sets of skills’… having just completed a short stint in Istanbul he is surprised to find Lenore and Kim arrive unannounced to share a few days of (broken) family bonding. The Mills family shouldn’t holiday. Within hours Brian is on the phone to Kim with the roles reversed – he even butchers his own line from the first film – clumsily telling her that Ma and Pa are about to be *GASP* taken. For the world’s most protective Dad Brian and his family sure get stolen a lot. It’s like driving to the pet store to buy a puppy after months of discussion and research, then getting home and leaving it in the car. And by the way just who is minding the white girl smuggling operation while all this is going on? All over Europe vacationing young girls are enjoying holidays and excursions without fear of being abducted by sleazy Eurotrash! Among Brian’s ‘set of skills’ is the ability to use a mobile phone – which given he is 60-something isn’t to be sneezed at (my Dad sends me blank SMS messages all the time by mistake). While lazily secured to the metal pole Dad calls his little girl and in about a minute somehow grants her Miss MacGyver status – must be in the DNA. Without even the time to button her shirt (thanks director!) Kim uses a shoelace and three grenades to track down Mum and Dad in a random grotty Turkish building. Tag. Over to you Dad. For his part Brian doesn’t even seem that pissed this time around, more annoyed that he has to work on his holiday. During the various life or death struggles and poorly edited fights between him and multiple Albanians he comes across as plain old bored – so is the director. 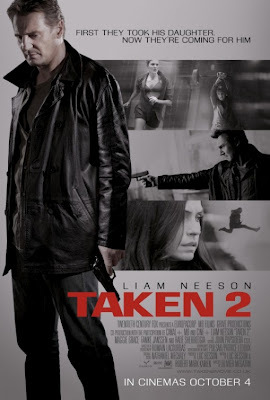 Where the first Taken was lean and mean and better than it deserved to be, Taken 2 is unfortunately exactly what you expect given the material. A muppet could predict what happens next. In fact aside from this one sentence summarising the plot ‘Albanians hate an American that killed their family members in France so they follow him to Turkey to kill him’, that same muppet could predict the events in Taken 2 from opening credit to last. That’s not to say it’s all bad, Liam Neeson is blessed with the ability to remain watchable even in crappy films when his heart isn’t really in it. But like most sequels Taken 2 is a pale imitation of an original that chooses to rehash events rather than further the story. Final Rating – 6.5 / 10. If the Albanians were pissed after Taken imagine how they feel after Taken 2. What they’re all dead? Died horribly you say? Oh well, too bad.